Description: I dont recall that any of the other E 60s got repainted in this scheme. This one was at Hoboken for the festival, and may have been painted primarily for the purpose of showing it off there. The E60s never had the success of the GG 1s, and were soon replaced by a variety of European design electrics in the late 80s and 90s. This unit had to be towed in, as it was powered by alternating current and could not run on the DLW 3000 volt DC network. Description: The motor off a New York train has uncouplled and is now pulling forward so diesels can take over. Somehow its not the same without GG 1s and Es. 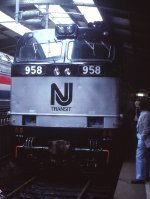 Description: NJT 958 rolls back through the station to the engine house at South Amboy. Description: NJT leads a New York train into the station at South Amboy to do the time honored engine change. Description: A New Jersey Transit E60 electric motor stored in Morristown, NJ. Description: Morristown Yard before URHS equipment was moved to Boonton. 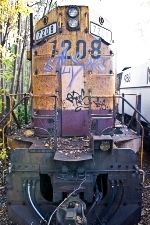 Description: West Boonton Yard, on NJT. 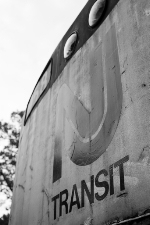 United Railroad Historical Society of New Jersey. Description: A newer piece to the URHS collection sandwiched between a former Lackawanna MU and a NJT E60. Description: One of only two former Amtrak E60s left in existense, the other, AMTK 603, resides at Strasburg, PA. Description: The other one is at the RR Museum of PA. Description: An awesome electric locomotive that will never run again.